The side is a great location for a feather tattoo, and this girl’s feather tat follows the natural curve of her ribcage, with the tip of the feather just barely reaching below her breast. 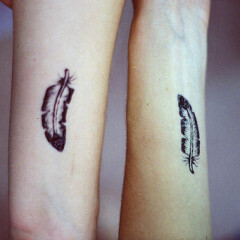 The feather in the side tattoo is inked in black and white and is very textured and flowy. 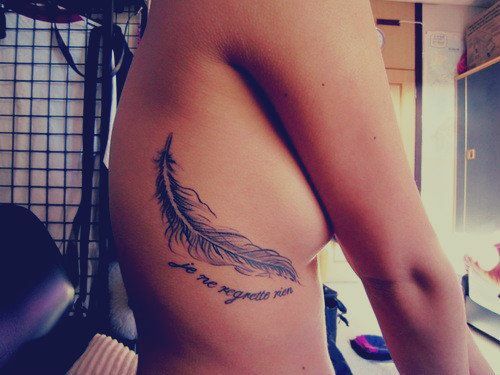 There is also text written in script below the feather that reads “je ne regrette rien,” which is French for “I regret nothing” or “I don’t regret anything.” The black and white feather tattoo is very feminine and the feather looks elegant and delicate, which is perfect for feather tattoos for girls. 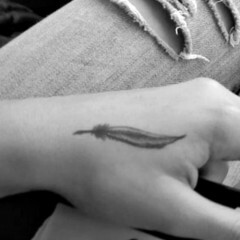 Some girls choose to get feather tattoos just because they like the way they look, but the text included in this large feather tattoo gives the impression that the tat symbolizes something pretty personal. 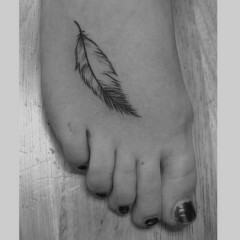 In this case, the meaning of a feather tattoo could represent a desire to feel free or unburdened.